Deputy Defense Minister Ben Dahan:'IDF will respond fiercely and unhesitatingly' to attacks by Israel's enemies. Deputy Defense Minister Eli Ben Dahan spoke Wednesday to 600 soldiers from various units who were visiting the Begin Heritage Center during a tour of Jerusalem sites. He told the soldiers that "There is no better expression of the Jewish state than the IDF. The past year has been particularly stormy for the IDF, which finds itself under attack in different sectors which are not necessarily battlefields but instead are in the realm of public opinion." Ben Dahan added that "the IDF is the people's army, an army which unites all sectors of society. An army which does not just fulfill military goals and prepare for war but also serves social and moral objectives. An army which is based on Jewish values of ethics, mutual aid, assisting the weaker members of society as well as Jewish courage and defense of the nation and the country." 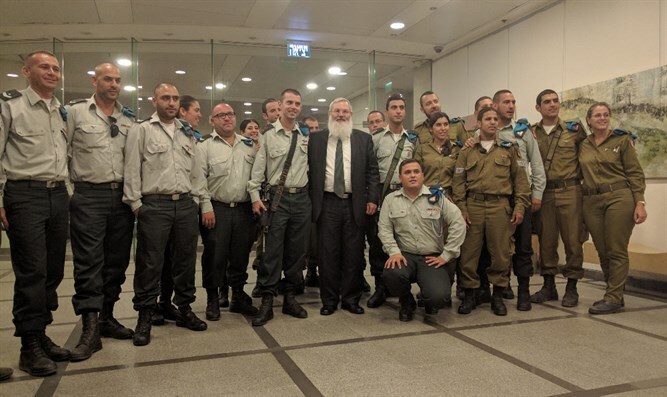 The Deputy Defense Minister also referred to the rocket attack on Sderot and stressed that "our soldiers are spread around Israel's borders from North to South and are ready to respond and to protect the citizens of Israel.from every threat or enemy. Just today we saw how our enemies tried to test our preparedness by firing into the South and the IDF responded immediately and fiercely . "You have merited to be part of the IDF, the army of the Jewish people who have returned to its homeland. The IDF is our army, my army as an artillery officer, that of my sons serving in combat units, your army and that of all the generations after you and that is why we must ensure its continuity," concluded Ben Dahan.